Using eco-friendly cleaning products sounds like a great idea, but not all of them can get the job done — so today we’re sharing tips on green cleaning products that actually work, whether you’re integrating them into your own routines for keeping a clean house or you’re asking your cleaning service to use green cleaning products. One product I really like is Method Bathroom Cleaner. It’s not the most effective bathroom cleaner in the world, but it doesn’t irritate my lungs like harsh cleaners do, and it’s safer for my skin. Kat is a fellow fan of Method products — though at her house, it’s Method Daily Shower Spray Cleaner — and she also likes ChemFree Toilet Cleaner (which uses “mineral magnets”) and the Zip-It drain cleaning tool as an alternative to Drano [affiliate links]. Pam Moore, who lives in Boulder, CO, makes cleaning spray with water, vinegar, essential oils (tea tree or peppermint or lemon), and ammonia — sometimes replacing ammonia with Dawn. (Remember to never mix ammonia with bleach.) For homemade laundry detergent, she mixes Borax, washing soda, soap, and water. When she mops the floor with a steam mop, Pam uses water with a few drops of essential oil for a nice scent. “I definitely think the kitchen counter spray and laundry soap work just as well as what I used to buy at the store,” she says. If you don’t have time to make your own green cleaning products (or just don’t feel like it — that would be me), you have plenty to choose from at the grocery store or Amazon, of course. But the FTC has caught many companies making misleading claims about green products, so how do you know whether to trust the manufacturers’ ads and labeling? Companies aren’t even required to give the complete list of a cleaning product’s ingredients on its label. A few helpful resources from this Washington Post article are the EPA’s Safer Choice label, Whole Foods’ Eco-Scale rating (only for products sold at their stores), and UL’s ECOLOGO Product Certification. Note that The Environmental Working Group may not be the best resource for this — the advocacy group has often been criticized for fear-mongering and incorrect claims. Lawyer/journalist and Corporette contributor Rebecca Berfanger often uses lavender Dr. Bronner’s Pure-Castile Liquid Soap, which can be used for all sorts of home tasks, such as cleaning the bathtub, and is part of this DIY laundry detergent recipe. (The description on the Dr. Bronner’s website recommends their Castile soap for “Face, body, hair & food, dishes, laundry, mopping, pets” — and it’s fair-trade, too.) Rebecca also likes a green laundry detergent called ECOS. She uses green cleaning products (such as these Green Works wipes) for cleaning things her cats will be in close contact with — and for household spot cleaning, she uses either the wipes or a green cleaning spray. Note: For this post, we do recognize that anecdotes do not equal science (check out this article by Wirecutter’s science editor, who has a PhD in chemistry), but the cleaners used by the women we talked to clearly work for them! Also, note that the word “natural” doesn’t have an official meaning, and “green” can be vague, too — but they’re hard to avoid in a post like this. 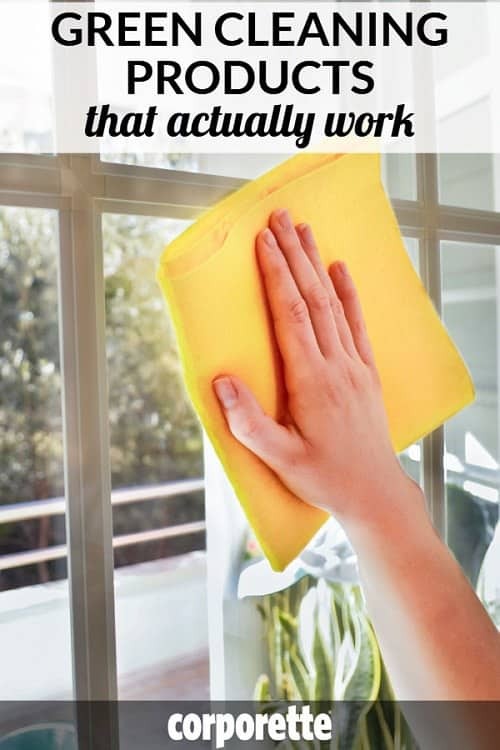 Have you found green cleaning products that actually work? Have you hired a cleaning service that uses green cleaners? Why did you make the switch? (Are there certain chemicals you’re especially worried about?) Do you make your own or use store-bought? Which ones have you found that work really well, and which haven’t really been up to the task? Do you find yourself spending more or less money with environmentally-friendly cleaning? Stock photo image via Deposit Photos / cunaplus.